Many of the B&Bs that we work with in France are really offering that little extra something. We have several hosts who don’t just offer the standard bed and breakfast experience but also the opportunity for you to thoroughly relax and be pampered during your stay. You will find indoor swimming pools, jacuzzis, saunas, massages with essential oils and various other ‘treatments’ available, sometimes for a small extra fee. Here is our pick of the bunch. 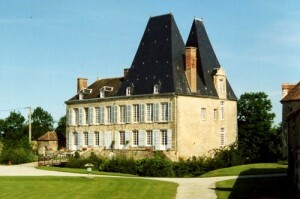 This family-owned chateau accommodation near Alencon in Normandy has recently installed a sauna and a spa pool and also offers essential oil massages for that throughly relaxing effect. 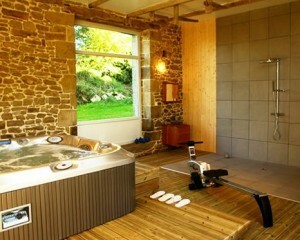 Private access to the sauna and whirlpool is €60 for two people for 2 hours and an hour’s massage is just €70. Make sure you book dinner in the evening during which you will enjoy organic produce from the chateau’s potager and other fine organic produce from local sources. Go on, spoil yourself! Click here or on the photo above to view full accommodation details and then click the ‘enquire for availability’ link to make your request for specific dates. This one is a cracker, in my opinion. Located just 10 minutes from the north coast of Brittany and the town of Perros Guirrec, this charming bed and breakfast accommodation gives you the opportunity to experience the traditional Moroccan Hammam, otherwise known as a Turkish Bath (bathrobes, towels & slippers provided). The ritual starts with a 10 minute session in the hot room, perfumed with eucalyptus essential oils which opens the pores. There follows an invigorating shower to wash away the impurities. Finally, the traditional Moroccan ‘Kassa’, or exfoliating glove is deployed to remove all that dead skin. And voilà – a new you! Various relaxing massages including a hot stone massage, traditional thai massage and Californian massage are also available for a small fee and by prior arrangement. Click here or on the photo above to view full accommodation details and then click the ‘enquire for availability’ link to make your request for specific dates. In the midst of the countryside but just 20 minutes from Disneyland Paris, this bed and breakfast accommodation offers various formula centred around their sauna, hammam and jacuzzi (bathrobes and towels provided). For just €20 per person you can enjoy the facilities for 1h30m. If you have more time on your hands, why not opt for one of their formula which include a variety of massages, facial treatments, reflexology and scented baths. There really is something for everybody here! Full details on request. Click here or on the photo above to view full accommodation details and then click the ‘enquire for availability’ link to make your request for specific dates.